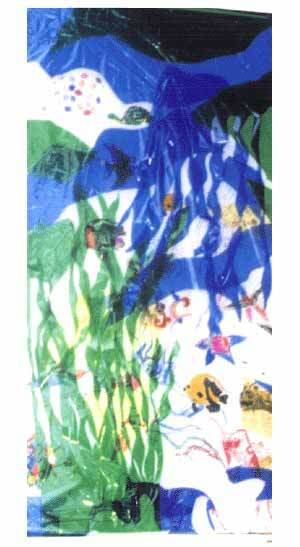 Kim Wade not only orchestrated the Mantra Fish project at the Ananda Ashram Gallery, but also on March 21, 1996 she did an additional piece at Robert Wood Johnson Hospital in New Brunswick, NJ. With the children patients at the hospital and visitors watching and participating, she set up her 8 ft. vinyl piece on a large foam board anchored to a pillar in the atrium of the hospital. There, the children worked on tables nearby, coloring fish images, the outlines of which were created by artists and others from all over the country. The ocean piece materialized throughout the next few hours via permanent magic markers, waves of colored cellophane and a quiet synchronicity. The children's fish leaped on to the sea taking form before them. RETURN TO "Plastique--The Ocean Show"